We know it’s a pretty tough call to make when determining whether or not it’s time for an exterior paint job. The process alone seems somewhat daunting and deciding when to do it can be tricky. The first and sometimes toughest step of the process is simply taking the time to closely examine your building. We, at FS Painting Services, have compiled a few warning signs that indicate when your home or building is a prime candidate for a few fresh, new coats. Dry Rotting – This is usually caused by a specific species of fungi that digests parts of the wood that typically gives it its durability and overall strength. Examine your exterior boards carefully. It may be necessary to replace some boards prior to painting. Extreme Cracking or Breakage – For any type of structure, when cracking or breaking of the base building material occurs, it’s a great indication that it’s also time for new paint. 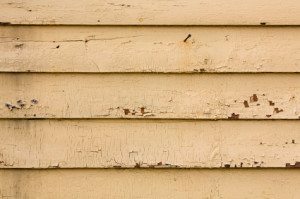 Chipping or Peeling – If you can visibly see the paint chipping or peeling from your building, it’s time to act before things get worse. Color Fading – Your building might look a bit dull and doesn’t quite stand out or carry its former healthy glow. Our variety of weather and direct sunlight will cause paint to deteriorate and fade over time. Get your color back and protect your exterior. Your Caulk is Shot – Good quality caulking is designed to last 10 years or more. If the caulking around doors and windows is cracked, dried and/or coming off, it’s probably time to revisit your overall exterior protection, including paint. Timing – If you can’t remember the last time you’ve painted your building or if the previous five items have you nodding in agreement, you should give us a call. FS Painting Services will be able to assist you in all of your exterior painting needs. Now is a great time of the year to call and set up an appointment with one of our professionals before your home or building is subjected to the wide variety of fall and winter weather. We can completely transform the look of your building with just a few coats. Contact us at 866-551-3454 to keep your place looking great.